Beach Club II is a North Myrtle Beach resort that is not only just minutes away from all the fabulous amusements and attractions found around Myrtle Beach and North Myrtle Beach, SC, it is a North Myrtle Beach resort that has a variety of amenities that you can enjoy during your North Myrtle Beach vacation. 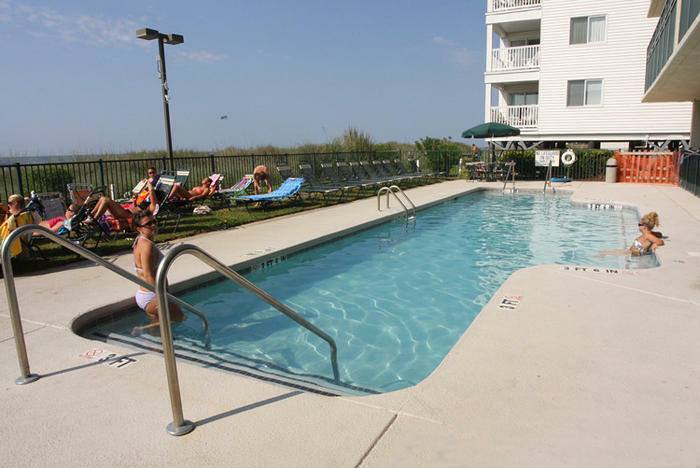 All of the North Myrtle Beach vacation rentals at Beach Club II face the Atlantic Ocean and white sandy beaches. The oceanfront balcony in each of these North Myrtle Beach rentals has gorgeous views of the ocean. There is an oceanfront swimming pool, grill area and sun deck that make the grounds of this North Myrtle Beach resort most delightful. Make reservations for a North Myrtle Beach condo rental at Beach Club II and enjoy the peace and quiet of this North Myrtle Beach resort while being closely located to all the wild fun. These spacious condos in North Myrtle Beach, SC feature three bedrooms and three baths. The design and layout of these North Myrtle Beach boast sleeping arrangements for eight people. So bring extended family or some friends on this North Myrtle Beach vacation with you. In the North Myrtle Beach condos at Beach Club II there is plenty of room for everyone to have a little privacy in an oceanfront setting. The amenities inside each of these condos in North Myrtle Beach, SC include conveniences such as a washing machine and clothes dryer and luxuries such as a fully furnished kitchen. Having these appliances at your fingertips can make all the difference in the world when it comes to your North Myrtle Beach vacation. The kitchen has a dishwasher for easy clean up after enjoying cold drinks and snacks throughout the day of your North Myrtle Beach vacation. You will always have things to keep cold in the refrigerator and there is a stove and oven in case you want to make more of a meal during your stay at this oceanfront North Myrtle Beach resort. Wireless Internet access is another amenity in these North Myrtle Beach condominiums and DVD players along with numerous televisions are also part of the package for you to enjoy during your North Myrtle Beach vacation. A Jacuzzi tub is a relaxing component of the master suites at Beach Club II and that is a perfect destination after you worked hard on an 18-hole Myrtle Beach area golf course. From the oceanfront balcony of your North Myrtle Beach vacation rental at Beach Club II you can see the sparkling blue swimming pool. Your family will definitely want to grab a lounge chair and retreat to the pool area when the sun is shining brightly. Refreshing water, comfortable seating and the sound of waves crashing ashore make the perfect setting for a lazy afternoon poolside. Next to the blue shimmering water of the Beach Club II swimming pool is a grill area and a deck with tables and chairs. Take your family to the oceanfront of this North Myrtle Beach resort for a cookout they won’t soon forget. Throw some hamburgers and hot dogs, or if you prefer, shrimp and fish, onto the grill and make it an event. You can eat on the wooden sun deck underneath an umbrella. Bring your camera because family photo opportunities are right around the corner when you choose a do-it-yourself, oceanfront barbecue in North Myrtle Beach, South Carolina. The beach is easily accessed from Beach Club II. Walk out to the white sandy beaches and admire the postcard-perfect views of the Atlantic Ocean. Occasionally you might see a dolphin swim by this North Myrtle Beach resort and often you can see boats right offshore. Look for the Cherry Grove Fishing Pier and get up early enough to see a glorious oceanfront sunrise during your North Myrtle Beach vacation at this oceanfront resort. Beach Club II is supremely located near shopping, dining, water sports, more than 100 Myrtle Beach golf courses, amusements and live entertainment theatres. You do not have to travel far to fill your day with tremendous attractions. There is so much shopping in town that you could spend your entire North Myrtle Beach vacation shopping the outlet malls, boutiques, antique stores, consignment stores and malls. You will never believe how many restaurants there are in the Myrtle Beach area. The answer is more than 1,500, far more than you can count and definitely more than you can try during one North Myrtle Beach vacation. Get wet while engaging in the water sports in North Myrtle Beach, South Carolina. Parasailing, Sea Doo rentals, banana boat rides, fishing excursions and kayak rentals are among the water sports that are readily available nearby. You can’t find a better vacation destination for golf. There are so many golf courses in town that you can play exactly the golf course that you want to play. The live entertainment theatres offer fabulous productions for the whole family. Go see more than one show as The Alabama Theatre, Carolina Opry, Pirates Voyage and Palace Theatre are in close proximity to this North Myrtle Beach resort and that is just the beginning of the list of live entertainment theatres.